We work will all broadband providers to get you on-line again as quickly as possible. We work with Eircom, Vodafone, Magnet, Clearwire, UPC, Smart, Digiweb, 02 and Imagine. All your systems have lost access to the internet. Just one of your computers has lost access to the internet. You can connect successfully but a small percentage of sites cannot be accessed. You have intermittent access to the internet. Your modem / router is not showing the usual light sequence on its front panel. You have been told by your internet service provider that the problem is with your computer and not with the connection. 1) Do you get a solid green DSL light on your modem? A solid green DSL light usually indicates broadband is reaching your modem. 3) Temporarily disable any anti-virus or firewall software that might be blocking your connection. 4) Make sure that "power management" feature of your network card is disabled. Every time I reply to or create a new message in Outlook 2010, it crashes? Outlook 2010 crashes when starting up? This can usually be remedied by performing a repair install of Microsoft Office 2010. However, in some circumstances it can be indicative of other issues wth your system such as a failing hard disk drive or defective RAM. This type of problem is often caused by a corrupt printer driver. Uninstall the driver, download the latest version from the HP website and this should resolve your problem! If you’re using a 64-bit operating system, make sure that you’re using the correct 64-bit printer driver. I’m using Sierra OS. 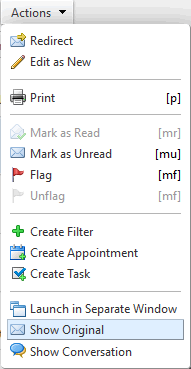 I can receive emails in Outlook fine but the body of the email is missing, how do I fix this? This can happen if your default email reader is set incorrectly in Mac Mail. To resolve this, open up Mac Mail, go to Preferences > General. Where it says “Default Email Reader” change it to “Microsoft Outlook”. The email search function in Outlook 2016 is not working? How do I fix this? If this does not work, your next best option might be to rebuild your Outlook database file. If an Outlook data file rebuild is needed, make sure you perform a backup first. I have emails stuck in my Outlook 2011 outbox? How do I send these? From the Outlook menu, select “offline”. Then close Outlook. Once Outlook 2011 has restarted, bring it “online” again. Then re-try sending your stuck emails. I have Gmail setup in Outlook 2016 for Mac but each time I check for new email, it wants to download hundreds of old emails messages? Login to your Gmail account. Go to Settings > POP / IMAP. Here you can limit the amount of emails which Outlook will attempt to download from the server. I’ve just setup my Gmail account in Outlook 2016, I think all the settings are correct. However, I still cannot send or receive any emails? First of all, make sure that your Gmail is configured correctly sync with Outlook. Then double-check all mail server and authentication settings in Outlook. Tab-outgoing server, put a check in the top box. Tab-Advanced, incoming: 995 and check SSL. Outgoing, select SSL, then type 465. 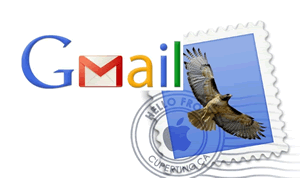 Using Mac Mail (Mail app) for accessing Gmail is a very common setup used by millions of Apple users. However, sometimes Gmail may stop working properly with Mac Mail resulting in emails not being sent or received. Below are some Gmail support questions which we get asked frequently. We hope they are useful to you in solving your Gmail problems. Mac Mail is not accepting my Gmail password? Make sure that your password is correct by logging into your Gmail account directly via your web browser. If your Gmail password is correct but it is still getting rejected, go to your Gmail account settings and make sure it is configured to allow access for less secure apps. Once this setting has been changes your Gmail password should work with Mac Mail. Every time I try to access my Mac Mail, I receive the message “Mail can’t connect to the Google account Gmail”? This can occur if your Keychain data is corrupted. Or, it can occur if you have “two-factor authentication” configured in your account. My Gmail in Mac Mail is offline. How do I get it online again? Gmail uses Internet Message Access Protocol (IMAP) for sending and receiving email. It’s incoming mail server should be configured as imap.gmail.com. SSL is required and it used port 993. For outbound email Gmail uses smtp.gmail.com. SSL and TLS is required. The SSL port is 465 or if TLS/STARTTS is used the port number is 587. I have two email addresses setup in Mac Mail. However, when I send an email, it always sends from my main Gmail account and does not present the option to send from my other email account? Open your Mac Mail. Go to Mail menu > Preferences > Accounts, select your Gmail account, then "Account Information" tab. Click the drop-down for Email Addresses, choose "Edit Email Addresses". When you restart Mac Mail, the two Gmail accounts should in the “from” menu. I cannot receive email from my Gmail account in Mac Mail. Each time I open the application I receive the error message “Mail could not be received at this time”. Sometimes Gmail security features will restrict access to Mac Mail accessing its servers. 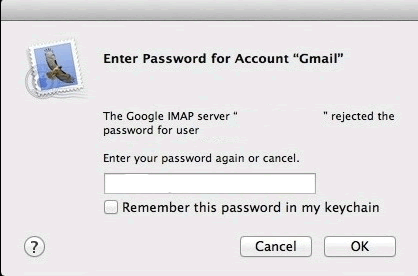 To remedy this problem, you need to login to your Gmail account settings and give Mac Mail permission to access Gmail. My Gmail account keeps on going “offline” using the mail application on my MacBook? Email attachments no longer show in Mac Mail, how do I fix this? When email attachments disappear in Mac Mail, you can go to the Preferences menu. Then go to Accounts and select the problematic email account. Under Account Information, look at the option “download attachments” and make sure to choose the “select all” option. Your email attachments should now be showing again. I keep on receiving Winmail.dat attachments from a contact and cannot open them. She claims there is something wrong with my computer? No, the problem resides with the sender and not you! The sender most probably sends email messages in RTF (Rich Text Format), a format which is not fully supported by all email clients. You can download a decoder such as “TNEF’s Enough” or get the sender to resend the email in HTML or plain text format. I keep on getting the message “unable to connect. There may be a problem with the mail server or network. Verify the settings for the account eircom.net or try again” How do I fix this? 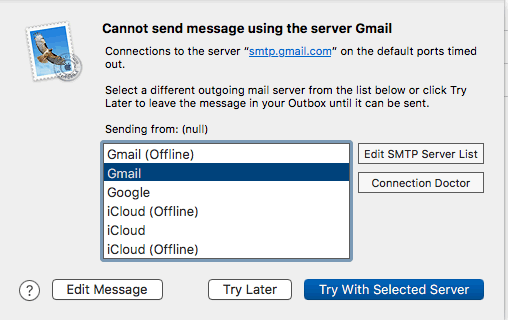 Can I set-up Gmail in Outlook for Mac 2016? Yes, Outlook for Mac 2016 natively supports Gmail. Compared to my iPhone, there always seems to be a delay receiving emails on my MacBook? On your MacBook, navigate to General settings of Mail App and navigate to the General tab. Make sure that the interval for “check new messages” is set every 15 minutes or less. Changing your “IDLE” settings in Mail can also reduce delays in receiving emails (in Mail App go to Preferences > Accounts > select problem account > then select Advanced. Check the checkbox with “Use IDLE command if the server supports it”). This should make your emails arrive a little quicker. Can I delete Gmail emails from my MacBook (Apple Mail) without deleting them from my Gmail account online? In Apple Mail, under the settings for Mailbox Behaviors, make sure “Store Deleted Messages on the Server” is ticked. This will make them available to other email clients and will mean you can still access them directly in your Gmail account. How do I open the Connection Doctor in Mac Mail, it states “trying to login to this SMTP account failed. Verify the username and password are correct” for my Gmail account. How do I fix this? Make sure your SMTP settings are correct. If you’re sure they are, try re-adding Gmail’s SMTP settings into Mail. Mac Mail keeps on asking for my password? If Mac Mail keeps on asking for your password you need to reset your keychain. I keep on receiving the message “unable to receive mail” followed by “there may be a problem with the mail server or network”. How do I get my email working again? Make sure you’re using the correct POP3 or IMAP email settings as recommeneded by your email provider. How do I change the IMAP port number on Mac Mail? 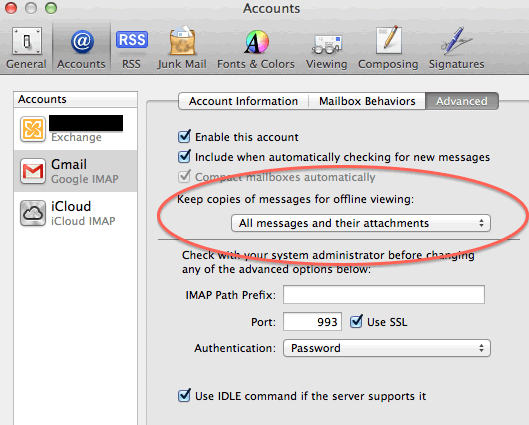 To change the IMAP port number, go to Mail > preferences > Accounts > select Account Name > Advanced. Here you can check the IMAP port number. Usually for IMAP, it’s 143 if SSL is not required. If your IMAP account requires SSL, the port number is usually 993. However, do check the documentation of your account provider as some email providers use different settings. I am trying to export my 1.1GB mail store in MBOX format. However, when I export the Mailbox only 560MB gets exported? What am I doing wrong? It sounds as if there is corruption in your mailbox. Try re-building your mailbox. I have my Gmail account setup in Apple Mail. However, some attachments are missing? Open Mail, go to Accounts. Click on the advanced tab and make sure that “Keep copies of messages for offline viewing” is set to “all messages and their attachments”. How do I stop email messages appearing in Spotlight search results? To prevent email messages appearing in Spotlight search results, go to Apple menu > System Preferences > Spotlight > Search Results and de-select the “Mail and Messages” checkbox. In Apple Mail, there is a lightening symbol beside my email account which is unable to send or receive emails. How do I fix this? The lightening symbol in Mail is usually indicative of a connection failure between the application and the mail server. This might be due to an incorrect POP or IMAP port setting. Or, this problem can be caused by misconfigured security settings such as SSL being disabled when your email provider requires it enabled. In rare cases, this problem can be attributed to your DNS server not responding on time. I cannot send out eircom.net emails in Apple Mail. The program keeps on reporting “could not connect to the SMTP server”? You might have the wrong SMTP server configured or incorrect settings for it. Make sure you input the correct mail settings as recommended by Eir. Using Apple Mail, I cannot send out eircom.net email. The program reports “trying to log in to mail1.eircom.net. Verify the username and password are correct”. I’m pretty sure they are correct. In a situation like this, you can verify your eircom.net username and password using their webmail service. If this grants you access to your emails, it signifies you’re using the correct username (email address) and password. Therefore, your problem probably resides with your Apple Mail configuration. Make sure you’re using the right SMTP server, mail port and SSL authentication settings. Mac (Apple) Mail keeps on freezing and crashing on me. How do I fix this? Mac Mail is crashing when opening. How do I stop this? There are many reasons why your Mac Mail might be crashing when opening. However, there are a number of possible solutions. 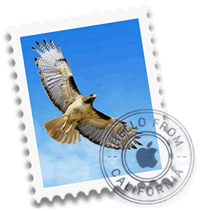 Make sure that you’re using the latest version of Mail.app. Try re-indexing your mail box. Try booting your Mac into Safe Mode and then restart Mail. My Mac Mail keeps on asking me to enter a password for Gmail. A dialog box pops up with the message “Enter Password for Account Gmail” How do I fix that? A dialog box repeatedly asking for emails passwords can be very annoying. This can sometimes occur if the password stored in your Keychain is incorrect. If so, the fix is simple. In the dialog box, make sure that the checkbox “remember my password in my keychain” is ticked. If this doesn’t work and you’re certain your password is correct, you might have to manually re-enter it in Mac Mail settings. Go to Preferences > Accounts > select relevant email account from left hand column. Then under Account Information, delete the password and re-enter it, not forgetting to click on Save when exiting Preferences. On my new Mac, I recently switched over to a newer version of Mail. But each time I want to view older messages I have to scroll down endlessly? This can happen if you’re not using the “classic view” in Mail. To change this, go to Preferences > Viewing and click to check “use classic layout”. I’m using Mac Mail but no email attachments are showing? Mac Mail no longer showing attachments can usually be fixed by rebuilding your mailbox. How do I backup my contacts from Mail onto a USB stick? Open the Contacts app from your Applications folder or using Spotlight. Select “All Contacts”. Then go to File and select Export > Export vCard. You can now save this file to your USB memory stick. My Mail App attachments are only showing as thumbnails. I would like to see a preview of attachments before opening them? How do I configure this? which should restore Mac Mail Preview functionality for you. To solve this problem, you need to re-index your inbox. How do I remove an old email account from Mail app? Open Mail > Preferences > click on Accounts. Select the account you wish to remove and then press the minus sign button. Using Mac Mail, I can’t search for old emails which is very annoying! How do I fix this? This problem can normally be resolved by rebuilding the indexes of your email store. To perform this, navigate to Library/Mail/V2/MailData. Then delete every file which begins with “Envelope Index”. My Mac Mail can receive email but cannot send? Go to Mail > Preferences > Accounts > select the problematic account. Once selected, make sure it is not using an SMTP server which has status “offline”. I use Mac Mail but when I send email to a recipient using Windows, they see a Times New Roman font of varying sizes – totally different to the format of my original message. This can sometimes look unprofessional. How do I change the default font in Mac Mail? To make your emails appear in a more consistent typeface, you can download the Universal Mailer plugin for Mail. It correctly formats messages Mail app messages in a more Windows-friendly way and offers an option to set a default font for outgoing messages. Mac Mail gets stuck at “downloading messages”? I cannot add a new Gmail address in Mac Mail? This problem usually occurs because Gmail’s two-step verification is blocking the addition of a new application trying to access it. Make sure that you’re using the verification code from Gmail instead of your normal Gmail password. Once you’ve entered the correct code, your Gmail account should now successfully sync with Mail. I can receive but cannot send email in Mac Mail? This is usually caused by a missing password or a misconfigured SMTP or IMAP settings in your Mac Mail client. Alternatively, your authentication or ports settings might be incorrect. I switched over to a new broadband provider (Virgin Media) but now I can’t send any email from my eircom.net account in Mail app? Ever since switching to Three Ireland broadband, I cannot send any email using Mail.app? 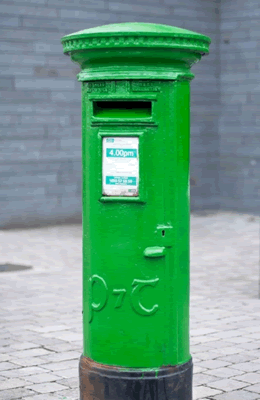 Make sure that your SMTP server is configured to connect with mail-relay.3ireland.ie. When I try to send email using Gmail I get the message “Cannot send message using the server Gmail” and some of my email accounts will appear as “offline”? I’ve upgraded to a newer version of OS X but now I can’t open Mail. The message “You can’t use this version of Mail with this version of Mac OS X” appears. How do I fix this? It is possible that you’re accessing Mail from the Dock but it’s icon is linking to an older version of Mail. To fix this, go to your Applications and drag the Mail icon from there to your Dock. That should refresh the association between the icon and application whilst hopefully fixing your problem! Mac Mail is reporting that “authentication failed”. My account is Yahoo email. How do I fix this? I updated my operating system to OS X 10.12.5 but now Mail app is unable to send email? Sometimes OS X upgrades can interfere with Mail app settings. One common cause for Mail app not working after an OS upgrade is SMTP authentication settings getting misconfigured. To remedy this, go to Mail.app. Go to your SMTP account settings. Click on the Advanced tab and change the authentication method to “password”. Also make sure that your full email address is listed as your username and re-enter your password into the password box. Mac Mail keeps on freezing on me, how do I stop this? There could be many reasons why your Mail app is freezing on you. There might be a problem with your hard disk, RAM, the operating system or the application itself. But an easier solution to try first might be to Trash your SavedState folder which might have gone corrupt. From Finder, go to Library > Containers > com.apple.mail > Data > Library > Saved Application State and move the folder called com.apple.mail.savedState to the trash. How do I get .JPEG files to appear as separate attachments and not embedded in the body of the email? When Mac Mail is open go to the “Edit” menu. Then choose “Attachments”. Make sure that “Always send Windows-friendly attachments” is ticked. Apple Mail will not open for me? This should reset LaunchServices needed to start Outlook. Mac Mail is running very slow. How can I make it go faster? 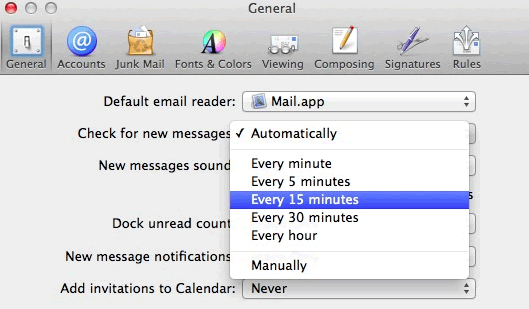 Your Mac Mail might be slow for a number of reasons. However, a quick fix might be to tweak your Mailbox Behavior settings. From the Mail menu, go to Preferences > Accounts > Mailbox Behaviours. There are a number of settings which you can check. Can I setup my eircom.net email address on my Android or Apple iPhone? Technically, you can setup your eircom.net email to work with a smartphone. But as eircom.net email does not fully support the IMAP protocol, email syncing will not work optimally. This can make searching for old received and sent emails extremely confusing. Therefore, you will probably better off using an email service which fully supports IMAP, such as Gmail. I cannot send out eircom.net emails using Vodafone broadband? Make sure you are using the correct outbound email mail server and you’re using the correct authentication settings. I cannot receive emails using my Eir broadband connection? 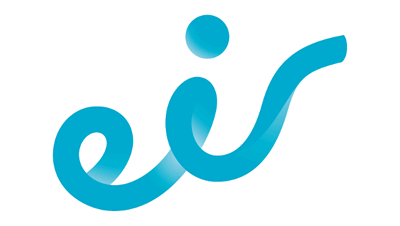 Being unable to receive emails using an Eir broadband connection might mean you have the incorrect inbound mail server configured. Using an eircom.net email account, the inbound mail server should be set to mail1.eircom.net. Make sure you’re using the default Eir SMTP port 25. Using my eircom.net email address, I cannot send out emails and I get the message “abusive content detected in your email”. There is no abusive content in my email! How do I fix this? Your email signature might be triggering a spam filter. Alternatively, your computer could be hosting viruses or trojans which is blocking your IP address. It would be advisable to perform a malware or anti-virus scan on your computer system. I’m using Windows Live Mail for my eircom.net email account but cannot sent out emails. I receive the error message “Unable to send or receive messages for the Eircom <account name> account. Your server has unexpectedly terminated the connection. Possible causes for this include server problems, network problems, or a long period of inactivity”. How do I fix this? This error is usually caused by using incorrect SMTP or authentication settings in Windows Live Mail. I cannot send out Eircom.net emails when I don’t connect to my home’s internet connection? This is because an eircom.net email account when used in conjunction with an email client such as Outlook or Apple Mail needs to use Eir’s SMTP server to send out email. To work around this problem, you can use the web-based portal of Eir email to send out emails when you’re not at home. How do I view the email headers when using eircom.net webmail? Within the eircom.net web client (Zimbra) GUI, select the email whose headers you would like to see. Click on the Mail tab, then go to Actions and select “show original”. Can I configure my eircom.net email account so all emails will be forwarded to my Gmail account? Yes, emails can be forwarded from your eircom.net email account to your Gmail account. Please contact us and one of our email support technicians will be more than happy to assist you. How do I set up an out-of-office reply on my eircom.net email address? Login in to Eir webmail. Navigate to Preferences followed by “Out of Office” and click on the radio button which says “Send auto-reply message”. I’ve just switched over to Virgin broadband, but cannot send out any emails? You need to make sure that you have configured your email client (Outlook, Mail App, Thunderbird, etc.) to work with Virgin’s SMTP server. I cannot send out emails using Virgin Media broadband (Ireland)? Make sure you’re using the correct outbound mail server and you have selected the right authentication protocols. I have switched to Virgin Media broadband, now I cannot send out eircom.net emails? Make sure you’re using the correct outbound email server and you’re using the correct authentication settings. There seems to be a delay in receiving some emails in Gmail? Inbound or outbound email delays in Gmail can be caused by several factors. Your first avenue of exploration should be examination of the email headers (of received emails). Email headers can give you an indication of all the “hops” which the email message made as it traveled through the internet and can sometimes reveal the reason for the delay. Using Firefox, I can log into my Gmail account successfully, but 1-2 seconds later, I am automatically logged out again. This is very frustrating, how do I stray logged in when using Gmail? To prevent Gmail from logging you out automatically, you need to clear the cache and cookies in your browser. To clear the cache in your browser, click on the “three dots” icon, then go to More Tools and select Clear Browsing Data. Using Outlook 2016, I cannot connect to my Gmail account. I keep on receiving the notification “Your IMAP server wants to alert you to the following. Please login via your web browser” followed by a URL link. However, I follow the URL, but it does nothing? Sometimes, when 2-step verification is enabled in your Gmail account, you will need an application-level password for Outlook. This can be found in your Gmail’s account settings. And while in settings, you will probably need to enable permission for “less secure” to grant Outlook permission to Gmail’s servers. When accessing Gmail using Chrome I keep on getting the error message “Loading error, please try Standard HTML view”? This is most likely due a browser extension issue. Temporarily, disable all browser extensions in your Chrome browser, re-start your browser and try accessing Gmail again. How do I send a large attachment in Gmail? Google supports attachments of up to 25MB in size. If your attachment is larger than this, it might be rejected by the recipient's email server. So, instead of clicking on the paper-clip icon at the base of the compose email window, click on the drive icon (it looks like a triangle) and upload your document or folder to Google Drive. Then just send the recipient the Google Drive link. I cannot find a lost email in Gmail. I’ve tried searching by inputting the subject line in the search box, but I still can’t find it? You can use Gmail’s advanced search feature. This can be found by clicking on the small drop-down arrow to the right of Gmail’s search box. This allows you search Gmail on a more granular level by allowing you to specify sender, subject, size and keywords. Google advanced search allows you to search emails within a specific date range and whether or according to filter emails which have an attachment or not. Using Internet Explorer, I’m unable to download attachments in Gmail? In Internet Explorer, go to Tools, Internet Options, click on Advanced (Tab) and uncheck “do not save encrypted pages to disk”. Click on “apply”. This should allow you download attachments in Gmail using Internet Explorer. When trying to download emails with attachments using Chrome, Gmail freezes on “fetching attachment”? How do I fix this? Attachments not being downloaded from Gmail can be caused ad-blocker software. Uninstall any ad-blocker software and re-try downloading any emails with attachments. Signing out of your Gmail account and signing back in again, usually solves this issue. I have AVG Internet Security installed on my Windows 10 PC. However, sometimes when I try to send an email I get the message “Error: Cannot connect to the server”. How do I fix this? The firewall component of AVG Security will sometimes block outbound connections needed for Gmail to send out emails. To “unblock” this, you need to create a firewall exception. Open up AVG Internet Security, click on Menu> Settings>Firewall>Customise. Under this setting change the application setting for Gmail from “autodecide” to “allow”. Also, make sure the “network profile” is configured to “private” instead of “public”. I’m missing emails (Gmails) after a certain date. How do I recover them? First of all, check your Gmail’s “spam” or “trash” folders so see if they were inadvertently stored in these folders. Make sure you’ve configured your Gmail account to read emails in Classic View, otherwise some messages may be hidden. Moreover, if you're using the business version of Gmail (GSuite), you might have a misconfigured email retention policy. Another possibility is that your Gmail account has been compromised (hacked) and your emails have been deleted by a malicious third-party. If you suspect this might be the case, it is imperative that you perform a complete security check on your account to reduce the risk of further damage. I think my Gmail account has been hacked, how do I secure it? Change the password on your Gmail account immediately. It is important that you change this password using a secure computing device free of malware and viruses. The reason for this is simple: if you change the password of your Gmail account on a computer which is still compromised by malware such as a keyloggers or trojans, it is possible hackers will capture your new password and will still have access to your Gmail account. It is also important that you check your Gmail’s forwarding rules – some hackers will configure your Gmail so that they receive a copy of every email you send and receive. How do I prevent my Gmail getting hacked in the future? It is imperative that you use a unique password for your Gmail account. That is to say, your Gmail password should not be used for any other website or cloud service which you use. The rationale behind this is simple. If you’re a frequent visitor to, let’s say, a tennis website, it is possible that at some stage, the website will get hacked and your username and password will get stolen. If so, the hacker will know your email address and password and, knowing that most computer users recycle passwords, they will use your tennis website password to try to access your Gmail account. And once they gain access to your emails and contacts, they can do all sorts of nasty stuff. Aside from using a unique password, it is strongly advisable that you enable 2FA (two-factor authentication) on your email account for added protection from hackers. How do I backup my Gmail account? Just because your Gmail account is stored in “the Cloud” – it does not automatically mean that all your emails are safe. Every year, millions of Gmail users get their accounts hacked, often resulting in deleted emails and stolen contacts. To prevent this from happening to your Gmail account – you should use a Gmail backup application such as Gmvault. This application will backup your emails to a local disk on your computer. 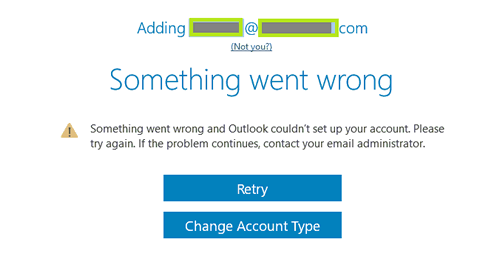 When I try to add an email account to Outlook 2016 (Office 365), I receive the message “something went wrong”? How do I add an account? First of all, with this type of problem, make sure that your account credentials (username and password) are valid. 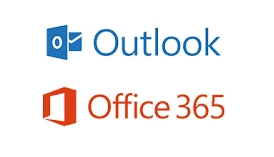 You can check them by logging into Outlook 365 OWA. Another possibility is that some versions of Outlook 2016 have a known bug with the “credential autodiscover” feature which means, even using the right username and password, the account still gets rejected. So, make sure you’ve applied all the updates to your version of Office 2016. It would appear that your existing profile is invalid or corrupt. Remove it, create a new profile and Outlook 2016 should open up successfully again. Your PST file, which is the folder which stores your emails and contacts has probably gone corrupt. Try running the SCAN.PST utility to fix the corruption. After this repair utility has successfully completed its operation, you should be able to open Outlook again. Outlook 2016 will not display images. How do I fix this? This is usually caused by a security feature in Outlook 2016. To resolve this issue, go to Options, click on Trust Center, under Microsoft Trust Center and uncheck the “Don’t download pictures automatically in HTML”. Outlook keeps crashing on me? There are several possible causes as to why Outlook is crashing on you. Your email storage folder (.PST file) or Outlook profile may be corrupt. Alternatively, you might have a problem with your computer’s hard disk. Using Windows 10, Outlook 2016 keeps on giving the message “trying to connect”. How do I fix this? This is usually the result of a corrupt Outlook user profile. Try adding a new user profile and re-start Outlook. I’m using Outlook 2013 and sometimes incoming emails disappear as soon as they arrive? This is a very frustrating problem, how do I fix this? This problem can occur if you have a filter set-up in Outlook. The filter will mark emails as read after a pre-defined number of seconds. To fix this, open up Outlook, go to View> click on Change View and then click on the Compact. Technically, you can setup eircom.net to work with a smartphone. But as eircom.net email does not fully support the IMAP protocol, therefore email syncing will not work optimally. This can make searching for old received and sent emails extremely confusing. Therefore, you will probably better served using an email service like Gmail, which fully supports the IMAP protocol. Outlook 2007 can no longer receive email? Sometimes Outlook profiles go corrupt. Try setting up a new profile in Outlook 2007. In many cases this can resolve the problem. I accidentally deleted my Outlook Inbox, can the emails be retrieved? Yes, in most cases emails accidentally deleted in Outlook can be recovered. In the meantime, we strongly advise that you refrain from using Outlook and computer system. Further use may jeopardise the chances of successful data recovery. I’m using a POP3 email account configured in Outlook. However, some emails are taking hours to arrive. What is causing the delay? There are a number of possible reasons why this delay in Outlook is occurring. Firstly, you can specify how long Outlook polls for new messages. Make sure this message poll interval setting is configured to no more than 5 minutes. Another possibility is that your emails are being delayed by some spam filter along their routing path. Send a test email and check the routing headers to see if you can pinpoint the problem. What is the difference between POP3 and IMAP email accounts? The primary difference between POP3 and IMAP is that POP3 emails are stored on device itself and not on a remote server. Using IMAP both the Inbox and Sent items folder are stored on a remote server, which is usually accessible from multiple devices such as desktop computer, laptop or smartphone. How do I transfer my emails from Outlook 2007 (Windows version) to Outlook 2016 (Mac version). You need to export your mail store folder in Windows as a PST file. You can store this folder on USB stick. Connect the USB to the destination computer and import the file into your Outlook 2016 on your Mac. How can I get rid of emails that are stuck in my Outlook outbox? Typically emails “get stuck” in the Outbox if they have not been successfully sent out. This is quite normal. The problem you need to solve is why your Outlook emails are not sending out. If you no longer need to send these emails out, you can simply highlight them and press “delete” on your keyboard. Every time I click on an email link, Apple Mail opens instead of Outlook. How do I make Outlook my default mail application? Open Mail. Go to Menu and choose Preferences > click General and choose “Outlook” as your default mail reader. Outlook keeps on showing “not responding” when sending out email? Try running Outlook in Safe Mode to eliminate the possibility that any add-ons are causing your application to display the “not responding” message. Using Outlook 2016, I cannot send an attachment. I get a message reporting “the file you’re attaching is bigger than the server allows. Try putting the file in a shared location and sending a link instead”. How do I send a large file in Outlook? If a file is too big to send through Outlook, try zipping it to make its size smaller. In Windows, right-click the folder and click on “send to compressed folder”. Using Outlook 2016, I cannot forward attachments? Failure to forward attachments in Outlook can be caused a faulty Windows or Microsoft Office update. To resolve this, uninstall any recent updates for Windows or Microsoft Office. This problem may also be caused by your computer’s anti-virus software. The Outlook 2016 search function is not working, how do I fix this? This can be caused by PST corruption. It can also be caused if the Outlook’s Index is damaged. To remedy this, you will need to rebuild the entire index. This can be a lengthy process and it is strongly recommended that you perform a complete backup of your Outlook data before you implement this solution. Outlook keeps freezing and hanging on me? There are a number of possible reasons why Outlook is freezing on you. For instance, your Outlook store folder (PST) might be too big. Your Outlook application itself might have gone corrupt and needs to be repaired. Alternatively, your Outlook might be freezing due to a hardware issue with your computer, such as a failing hard disk or a system which is overheating. My Outlook (2010,2013,2016) keeps on showing “not responding”. How do I fix this? When Outlook is “not responding” – the problem can be attributed to a number of possible causes. Your Outlook application might be corrupt. Your Outlook user profile might be corrupt or Outlook add-ons might be causing the problem. Alternatively, a hardware issue with your computer might be causing the problem. This is usually indicative of serious corruption with your PST file. We can perform a manual repair of your PST file which should enable you to retrieve old emails and contacts. Please contact us for further assistance. I keep on getting the error message “The file outlook. PST cannot be accessed – data error 0x80040116”. How do I fix this? This is a possible sign that your existing PST file has gone corrupt. A quick way to remedy this problem is to setup a new PST file and a new profile Account Settings > Email tab > New > Email Account > Next. Once you have inputted your credentials – make sure to click on the “Always use this profile” option. How do I open up an MSG attachment file in Outlook for Mac? An MSG file is a file created by an Outlook (Windows version). To open an attachment on your Mac – you can download the free “MsgViewer” from the sourceforge.net website. 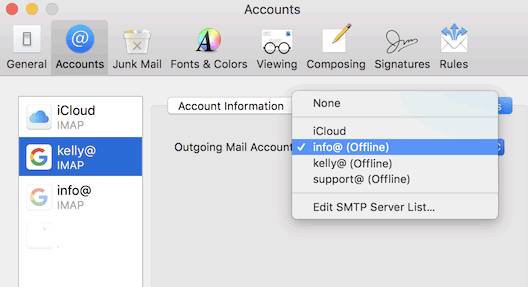 How do I backup my emails and contacts in Outlook for Mac? Open Outlook for Mac. 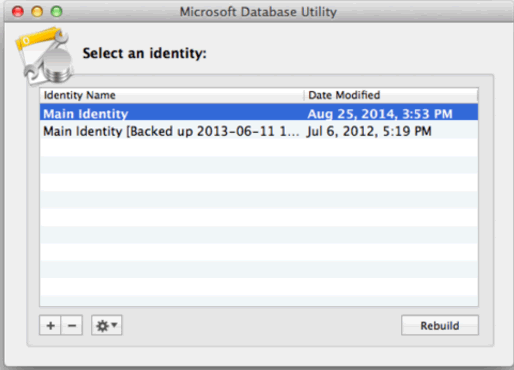 On the File menu, click on Export followed by Outlook for Mac Data File. To backup all items in Outlook, under “items of the following types”, click all the check boxes. I’ve recently migrated from Outlook 2016 to Office 365. However, all my contacts appear to be missing. How do I recover them? Navigate to the Contacts Tab, right-click and open Contacts Properties. Then click on Show Total Number of Items. You should now be able to see your old contacts from Outlook. When I try to send an email I get the message “Synchronizing subscribed folders for username@myemaildomain.com reported error 0 x 80048002: This task was canceled before it was completed”. How do I fix this? To remedy this problem. Follow the steps below. In the folder display window, make sure that only “inbox” is ticked. Click ok and exit the application. When I try to open up a http link from Outlook, I get the error message “General failure. The URL http://www.examplewebsite.com. Application not found”. How do I fix this Outlook problem? The simplest way to fix this problem is to make sure that your browser is set as the default browser. For example, to make Chrome your default browser. Click on the Menu button (3 horizontal lines), followed by Settings, then go to Default Browser and select “Make Google Chrome the Default browser”. For Firefox users, go to Menu, Options, General and under Startup, click on “make default”. Still having email problems and need some professional email support? Experiencing email problems can be frustrating and can be very time consuming to troubleshoot on your own. We offer a complete email support service that is accurate, quick and cost-effective. Our service is delivered over the phone, remotely and on-site. We provide email support for most email services including Gmail, Outlook.com, Eir, Vodaphone, Virgin Media, Blacknight, Sky and Register 365. We support common email applications such as Mail.app (Mac Mail), Outlook for Mac (2011 and 2016), Office 365, Outlook 2007, Outlook 2010, Outlook 2013, Outlook 2016, Thunderbird and Windows 10 Mail. Computer Ambulance has been fixing email problems (remotely and on-site) since 2003 and our friendly service has gained a reputation for dependability and technical excellence. 1) Perform a regular Inbox clean-up – When your Outlook mail store folders become too unwieldy, your Outlook will become sluggish to use. Make sure you clean up large attachments every month. 2) Use a quality Spam Filter – Filtering out spam before it reaches your inbox saves you time and reduces the risk of security threats infecting your PC. 3) Instead of all your old emails cluttering up your folders. You can download a free archiving program such as Mailstore. 4) If accessing email on a mobile device such as a laptop or iPhone, configure your mail settings so that your messages arrive into both devices. 5) For faster and more accurate searching of old emails, you can download a utility called Xobni which is much more efficient than Outlook's inbuilt search function. 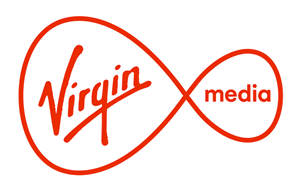 I’ve changed broadband provider from Eir to Virgin Media. Now I cannot send email out? What is Rich Text Format (RTF) email? RTF has been around since 1987 and has been developed my Microsoft until 2008 for cross-platform communication between Microsoft software. However, with the preponderance of email applications for OS X, iOS and Android, RTF is not always fully supported. For better compatibility, you might be better sending email in Plain Text or HTML format. 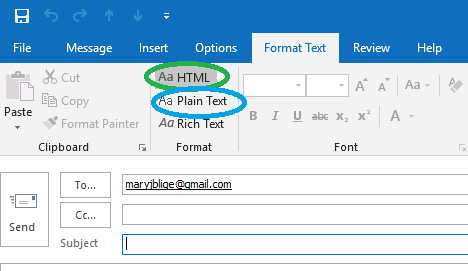 How do I send a Plain Text email in Outlook 2016? When writing a new message, click on the Format Text tab. Here you can select whether you want to write in HTML format or in Plain Text. What is the difference between an OST and PST file? An OST file is like a local cache of an online mailbox used in conjunction with an IMAP account. Whereas, a PST (personal storage folder) file stores your emails and contacts locally on your computer. What is the Outlook PST file size limit for Outlook 2010 and 2013? What is the Outlook PST file size limit for Outlook 2016? What is the Outlook OST file size limit for Outlook 2016? The theoretical limit is 50GB. However, go beyond this and stability issues are likely to occur. Therefore, it is advisable to keep your OST file well below this limit. Somebody I know has sent me an email. However, it only contains an attachment called “Winmail.dat”. How do I open a Winmail.dat file? Receiving a Winmail.dat file basically means your email client cannot read the sender’s email. However, you can down third-party Winmail.dat readers, which you can download for Windows or you can just get the sender to resend the email in HTML or Plain Text format. How do I email an encrypted Word or Excel file? You can download the free 7Zip application. Once downloaded and installed, you can right-click on a file or folder which you would like encrypted, select “7zip” and then “add to archive”. A dialog box will show a section called “Encryption”. Simply enter a password followed by “ok”. You now have an encrypted Word or Excel file (or folder). You can send the password to the recipient using another channel such as SMS or over a voice call. Why is my email getting treated as spam? Spam filters act an intermediary between your email server and your recipient's email server. Typically, spam filters will be triggered for a number of reasons. For example, if your email address has a random assortment of characters like wicwdazta@gmail.com, it might be perceived as spam. Likewise, if you send an email message to multiple users (in bulk) this might trigger spam filters. Lastly, spam filters can get triggered if the IP or server address from which they’ve been sent has been blacklisted by a spam authority. I keep on receiving duplicate email messages. How do I stop this? Duplicate email messages are sometimes the result of misconfigured email forwarding settings. For example, let’s say you have two computers, Computer A and Computer B and you’ve configured the email forwarding rules on A to deliver to Computer B. But you also have rules configured in the email application of Computer B to forward to A. You then create an email loop which results in duplicate email messages being sent. Thankfully, this problem can be resolved by always having a final destination for forwarded email. We’re using a Three broadband connection, sometimes emails arrive into our office but with no attachments. When the sender resends them using an email provider such as Gmail, they arrive just fine? This sounds like a firewall is blocking them. Make sure you change the MTU of allowable data packets in you firewall settings. Need fast and accurate on-site / remote IT support for Outlook, Mac Mail (Apple Mail), Outlook for Mac, Office 365 and Thunderbird? Call us on 01 - 685 48 38. Satisfied customers since 2003.